Purple Heart Recipient is Honored by Veterans (Embry-Riddle Aeronautical University News) A small crowd gathered in the DLC to honor a student veteran of Embry-Riddle Aeronautical University who is a Purple Heart recipient. Wednesday is last chance to apply for early retirement (Air Force Times) The window for most airmen to apply for early retirement closes on Wednesday. Transition GPS curriculum expands, implemented throughout DOD (Marines.mil) The Department of Defense is making sure its service members are more ready than ever to transition from military to civilian life with a revamped version of its current transition program, the Transition Readiness Seminar. Veteran-Owned Wall Street Firm Employs Disabled Vets (ABC News) When Lawrence Doll returned to the U.S. from Vietnam in 1969 he never forgot the help he received during his transition into civilian life. Job Fair Helps Veterans Find Work (NBC Connecticut) Even after five deployments overseas, Sgt. Woodrow Valle is still a member of the U.S. Army, but he was making contacts at the Heroes 4 Hire job fair for the day he gets out, shaking hands and handing out resumes. Job fair connects veterans with employers (WEAU) They’ve served our country and now, they’re looking for jobs. Owen School is popular transitional stop for veterans (Vanderbilt News) Military veterans and current soldiers alike are a familiar sight in the halls of Owen Graduate School of Management at Vanderbilt University. New Jersey Has Highest Percentage of Unemployed Veterans in America (Breitbart) New Jersey’s veterans are having a harder time finding a job than veterans in any other state, according to an extensive survey of veteran employment rates nationwide by the United States Department of Labor. Veterans’ Unemployment Edges Down but Remains High (Military.com) The unemployment rate for veterans who served since 2001 dipped slightly in 2013 to 9 percent, the Labor Department reported Thursday. Relatives of Pearl Harbor victims want military to identify remains (Los Angeles Times) Bethany Glenn never met her grandfather, John C. England, a 20-year-old Navy ensign from Alhambra who perished in the Japanese attack on Pearl Harbor. Casey says VA insults families, taxpayers by not releasing probe results (TribLive) U.S. Sen. Bob Casey Jr. contends it’s “an insult” that the Department of Veterans Affairs has not released the results of two internal probes into a deadly Legionnaires’ disease outbreak at Pittsburgh VA hospitals. Legislative report on vets housing makes startlingly bold suggestions (The Star Tribune) A little-seen legislative report on veterans housing makes some startlingly bold suggestions. Veteran’s job bill passes Senate (Legislative Gazette) After nearly a decade-long fight, Sen. Greg Ball announced the passage of legislation through the Senate that would facilitate the awarding of state contracts to disabled veterans. Military retirement: Change ahead? (Union-Tribune) A retired Marine Corps officer said he thinks young enlisted fighters deserve something even if they don’t stay for 20 years. Half of GI Bill Veterans Completed Educational Program (AllGov) Military veterans are making good use of the GI Bill of 2008 and its support for those seeking college education, a new report says. VA: Adaptive housing grant eligibility automatic for ALS (Today in OT) Veterans and active-duty military personnel with service-connected amyotrophic lateral sclerosis, or Lou Gehrig’s disease, now are presumed medically eligible for grants of up to almost $68,000 to adapt their homes, the Department of Veterans Affairs announced March 19. Some vets won’t have to report income for VA care (Military Times) Starting this month, veterans who qualify for care from the Veterans Health Administration under income thresholds will no longer need to report their income information to Veterans Affairs annually. Bill would remove cap on traumatic injury payments (Air Force Times) Two lawmakers have introduced a bill that would eliminate the $100,000 cap on payments to wounded warriors for multiple, severe injuries under the Traumatic Servicemembers’ Group Life Insurance program. House lawmakers cool to DoD pay, benefits proposals (Military Times) The Pentagon’s pay and benefits proposals for fiscal 2015 would be crippling for troops and their families, and potentially a disincentive for many to continue serving, according to House lawmakers who oversee personnel programs in the annual defense budget. This week’s LinkedIn career building essay comes from Katherine Tracy, MOAA’s Deputy Director for Healthcare Programs. You’ve made the decision to transition from the military and may be wondering how this impacts your healthcare benefits. Let’s take a quick look through two lenses: military retirement eligible or not. • agreement to become a member of the Selected Reserve of a Reserve Component the day immediately following release from regular active duty service. Military retiree’s under age 65 can choose between a managed care option (HMO), known as Tricare Prime, or a fee for service option called Tricare Standard. The main difference between the two is cost verses choice. Tricare Prime is least costly; whereas, Tricare Standard offers the greatest choice in selecting providers. Furthermore, the Tricare Prime option is limited to those who reside within the catchment area of a Military Treatment Facility (MTF). Tricare also comes with a pharmacy benefit delivered through three points of service listed below in the order of least to greatest out-of-pocket cost to you. Next, the Tricare Retiree Dental Plan (TRDP) provides a dental option for retiree’s as well as gray-area National Guard or reserve members and their dependents. Timely enrollment, within 120-days of eligibility, ensures the full range of benefits is available immediately. Otherwise, there’s a 12-month wait-period for crowns, bridges, orthodontics and dentures. Lastly, once retired, your Tricare catastrophic cap rises to $3,000.00/family per fiscal year. The catastrophic cap is your maximum out-of-pocket expense for Tricare covered benefits. Here, the key is Tricare covered benefits. If in doubt – ask! This has been a whirl-wind through the healthcare benefit structure. If you need further guidance or would like to schedule a one-on-one consultation to discuss your particular situation in more detail, call a MOAA Benefits Counselor at 1.800.234.6622. Finally, for those readers in career transition who have served as officers in any branch of the armed forces and are located in the greater Washington, D.C. area, The West Point Society of DC’s annual Military Officer Job Fair will be held on December 6 from 9:00 am to 12:30 pm at the Waterford Reception Center in Springfield, Virginia. For the second consecutive year, MOAA is assisting in the promotion of this job fair, which will be open to all military officers regardless of commissioning source or branch of service. There is no charge to attend and no pre-registration is required. For more details, please see http://www.wpsdc.org and follow the links to career networking night. Thanks for reading and happy holidays, Jim Carman, MOAA Transition Center Director. During my transition from active duty to the civilian world I found myself in the position of deciding just how I would procure health insurance for my family and I. As a uniform wearing Marine my healthcare was covered by the local aid station, clinic, or hospital, but once I hung it all up that option vanished when my ID card switched from “Active” to “Retired”. I have never had to make such a decision before; after all, medical care was part of the benefits package for those in uniform. Fortunately, at my local Naval Hospital there was a TRICARE service center. In the TRICARE service center was a real live human being who was both cheerful and helpful, and after spending a half hour or so with her I was able to make the right decisions and sign up for TRICARE Prime so that both my family and I would be covered once my HMMWV chariot turned into a pumpkin. Unfortunately, that service center and the 188 others that are spread across the continental United States will be closing next year. They will be replaced by a call center. Although TRICARE states that customers will receive better service by calling a 1-800 number I somehow doubt it. There is nothing like sitting down with a real person to get your questions fully answered. Sadly the cheerful and helpful lady who helped me out will likely be out of a job next year. Although TRICARE administrators project a $250 million savings by cutting the centers, the cost in terms of jobs and true customer satisfaction are going to be high. It’s here! 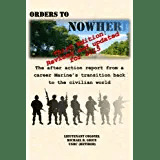 Orders to Nowhere is now a book! Since you are a loyal reader and follower of the blog that got it all started, you can use the discount code ZVGYFQ28 and save 10% off the cover price. Thank each and every one of you for reading and following my journey through transition! I wrote about not long ago about the government’s strong desire to reduce the health insurance benefit for military retirees. The subject has reared its ugly head again with a renewed attack on retirees who are enrolled in TRICARE, the health care system for military members, their families, and retirees. As reported in the Marine Corps Times yesterday (you can read the whole article here), Chuck Hagel, the Secretary of Defense, proposed that “working age” retirees should not be able to utilize TRICARE as their primary health care system but instead should be required to use their employer’s plan instead. TRICARE would only be used as a secondary or backup plan. Although the proposal is a long way from being written into legislation, it is a strong indicator that veterans are choice targets in the DOD’s battle of the budget. Should it become law, though, it will be a significant blow to the 1.6 million veteran retirees who are currently enrolled in TRICARE but have not yet reached age 65. Interestingly, the issue is one that impacts the Department of Defense and not the Department of Veterans Affairs, which is why the SecDef is pushing for the change. Most benefits for veterans are covered by the VA, but in the case of retirees it is the DOD that pays the bills. A retiree’s pension comes from the same place that it did when he or she was still in uniform: the Defense Finance and Accounting Service. TRICARE, the military and retiree health plan, is also covered by the DOD’s budget. And Chuck Hagel doesn’t like that very much. The DOD continues to bang the drum of readiness, and as happens at the end of every war the organization focuses inwards to guard as much of the fiscal pie as possible from those who demand that the post-war military machine shrink in response to the wars no longer being fought. I find that to be as normal as dawn follows darkness, but I also find the scapegoating of retirees to be a bit insulting. It is OK for the military to squander $34 million on a useless headquarters in Afghanistan that the military commanders on the ground didn’t even want, but it is not OK for the Department of Defense to honor its commitment to those who dedicate decades of their lives to the defense of the nation. Instead of conducting a thorough and critical review of the hundreds of billions of dollars spent (and often squandered) on defense equipment and service contracts Hagel finds it easier to go after those who actually went into harm’s way than the connected and powerful who never left the comfort of their own living rooms. It is an example of the oddly twisted thinking that pervades governmental agencies, and in my opinion it is just as hypocritical as the administration pushing to subsidize healthcare costs for members of congress and their staffs while ignoring small business’s pleas for relief from the costly requirements. Anyhow, if having my promised access to health care is cut as an expedient to allow the DOD to keep squandering the taxpayer’s dollar, then so be it. All I ask is for every military recruiter from every branch of service to explain to every prospective recruit and officer candidate that the benefits that they are being promised in exchange for the opportunity to risk their lives are not really promises. They’re just part of the honorless practice of bait and switch. I had always thought that we, as a nation, were better than that. Several months ago I received a rather large package from the Veterans Administration. Inside was the copy of my medical record that I had submitted with my claim some nine months earlier as well as a sheaf of rather official looking documents. Hooray, thought I! My claim was settled. Well, kind of. Actually about half of my claim was settled, and the other half was not. You see, as I departed active duty I was thoroughly examined by both military and veterans administration physicians as a part of the final physical process. The Navy doctors and corpsmen checked me out and documented everything that was relevant into my records, and the VA then followed up with an examination of their own to determine what conditions, if any, that I had developed during my service would be considered disabling. Having the conditions rated as disabling is important because the VA treats those conditions free of charge. In my case, about half of the conditions that had been identified during my physicals were rated as disability-related conditions and would be addressed by the VA in the future. The other half were marked as “deferred” because they needed additional information. The letter went on to say that they had requested a medical examination, and that I would be “notified of the date, time, and place to report.” It sounded reasonable, so all I had to do was be patient and wait. Then two. Then three. Four. Finally at month five I decided that my phone wasn’t going to ring any time soon and I needed to do something about it. But what? Thinking back to my experience at the Transition Assistance Course I remembered that a representative from the Disabled American Veterans had talked me through the VA medical evaluation process as he evaluated my medical record. I had signed a limited power of attorney that appointed the DAV as the Veterans Service Organization that would represent me in my VA proceedings, and now it was time to give them a ring and ask for some help. I did call the number, only to find that I was calling the wrong number. It turns out that the gentleman that I had worked with during the TAP seminar was not the same gentleman that I would be working with in my dealings with the VA. The guy at TAPS was fully engaged in meeting new veterans and helping get their claims processes started. Once the veterans were in the DAV system they (including me!) would be working with representatives at their regional office located in San Diego. So I called that number. Unfortunately their offices were closed for the holidays, so I called back once the holidays were over. I finally linked up with a live person and after speaking to a very nice lady who took down some basic information were instructed to wait for a representative to call me back. After a day or two of swapping voicemails because of missed calls the DAV representative and I finally linked up on the phone. I explained my dilemma to him, and he patiently explained what needed to happen next. Sensing my frustration, he continued. “What you need to do is to contact the VA and set up an appointment to get the ball rolling yourself. You need to do this quickly because if you don’t follow up on the listed conditions they may be disallowed because you are not showing that they are still a problem.” He then gave me the appropriate phone number for the closest VA office and we said our goodbyes. Hmm… So I need to get my sore knees and bad back looked at again? I had signed up for TRICARE Prime, so I could go to the doctor, but my decades of “sucking it up” had precluded me from making an appointment for something that did not involve broken bones or arterial bleeding. So I called the VA the next day. After a similar game of telephone and voicemail tag I spoke with a very helpful gentleman who understood exactly what my dilemma was. He checked his calendar and squeezed me into an appointment this coming Wednesday, where he promised to get my ship sailing in the right direction. 1. Contact your VSO immediately after you receive your VA claim settlement letter. I lost about five months as I waited for the VA to contact me before I finally got on the ball and started engaging the system. 2. The VA is buried in claims and the best thing to do is to take charge of your case. Waiting just means that others who are being proactive are jumping in line ahead of you. 3. Your VSO can explain the intricacies of the settlement letter in a phone call, but you have to contact them to initiate the conversation. 4. The next call you make after the VSO should be your local VA office in order to initiate the next steps in the evaluation process. If your claim is settled, then you need to contact them to be registered in their computer system so that you can access healthcare providers. If your claim is not fully settled, then you need to get registered and schedule appointments with the appropriate professionals in order to finish up your claim. The little things, part 3: Dental insurance. Who knew? A few posts ago I addressed the need to sign up for health coverage now that I have crossed over into the land of the transitioned. It also left you, the constant reader, hanging on the edge of your seat to find out just what I would do for dental insurance. The suspense must be killing you, so I’ll get straight to it. TRICARE offers dental coverage, but it is under the moniker Delta Dental. I don’t know why they call it that, but they do. At any rate, the Delta Dental program is pretty much the same on active duty and when retired, with the principle difference being that now the retiree has to pay for it. Before transitioning, dental care was the same as medical care – all you needed to do was go to the dental clinic and you were taken care of. Your family, on the other hand, needed to be covered by Delta Dental in a similar manner to how they were covered by TRICARE, so it isn’t that much of a change for them if they were using the plan already. It is a bit of a change, however, if they weren’t. In case your family has not been using the dental plan or in case you are moving to a new home, you will have to follow the same protocol as TRICARE enrollment and find an in-plan dentist. The decision to enroll is time sensitive, because if you wait too long there are some significant ramifications to your coverage in the form of limited coverage. If you enroll within four months (120 days) of your retirement date then the entire range of treatments are covered (with varying deductibles and whatnot) immediately. If not, you have to wait a year (365 days) for some expensive little things like crowns and bridges and implants and orthodontic work. Hmmm….you say. I don’t need braces, so maybe I’ll just roll the bones and wait to enroll until I really need dental care. Maybe that works for you, but what about the kids? Your decision to delay enrollment may seriously impact their ability to get orthodontic work, or more likely it will seriously impact your wallet when you find that they won’t be covered for a year because you chose not to enroll. Probably a good idea to go ahead and sign up! The cost is pretty reasonable, and the coverage is competitive with other dental plans. For an individual the cost is around $45.oo per month, and for a family of four it is around $150.00 or so. The actual rates vary by location, but these are good ballpark figures to work with. Exams and cleanings are fully covered. To get started, you must pay the first two months’ premiums up front, and you can enroll by mail, online, or by telephone. Very convenient! It helps if you ask the dentist that you would like to use if he or she is in the network, before enrolling. It will make things a lot simpler because then you don’t have to play “find the dentist”. Ask around – everyone has a dentist they like, and if your friends are former military then the odds are that they are using an in-plan provider. So get out and find a dentist – and get moving quickly if you want to ensure immediate full coverage for you and your family. Don’t wait for a filling to fall out or for a tooth to start aching- if you do then you will be out a lot of money that you could have saved with a phonecall and a few minutes of your time! 1. You are not automatically covered with a dental plan when you transition. It is not lumped in with the TRICARE medical plan, but instead is a separate and distinct insurance product. You need to sign up for Delta Dental just like you did for TRICARE. 2. Time matters. If you miss the 120 day window you are assuming some risk that can end up being very expensive should you need emergency care or braces for the kids. Preventive care is free, so don’t wait for your teeth to start falling out! 3. Ask around. People generally like their dentists and are happy to share who they are. A quick call to their office will let you know if they participate in Delta Dental (and in my experience most of them do). Once you enroll, a stop by the office with your documentation will get you into the dentist’s system and set you up for your first post-service appointment.